So, I made it! I survived three weeks of a sugar detox. I didn’t really think I could do it. For some reason, it seemed out of my reach. I mean, how could I possibly not eat bread, pizza, cookies, PASTA, or have a glass of wine for three weeks? I think the key is that I eased into all of this. Five years ago, I decided to go gluten-free. That was certainly a big adjustment. Then almost 2 years ago, I cut out dairy (goodbye sinus infections and phlegm). 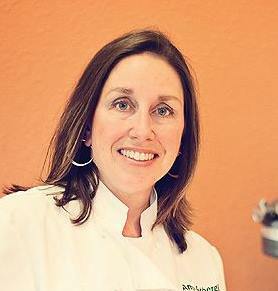 In the past year, I have dabbled with a Paleo diet but I never lasted more than a week or so. Still, I did start to shift in that direction. Before the holidays, when everything I was wearing felt tight, I decided it was time for action. I also committed to working out more. I looked into a few cleanses and plans but the 21 Day Sugar Detox felt right. I reviewed some of the recipes and they seemed to be straight forward. I bought the books, made a commitment to myself, and started a plan; almost 2 weeks before I actually started. This gave me time to plan meals and create shopping lists, read the book, and review the recipes. A few days before, I made some of the foods (homemade mayo, bone broth, and some roasted nuts for snacking). I planned about 3 days out at a time, making sure I had the food I needed in the house to be successful. If I was going out, I brought the food with me, packed in a lunch cooler, like I do for my children everyday. Sometimes I planned to eat out and figured I would do the best I could. But I did not eat out as often. Breakfast: homemade sausage (my own recipe) or other breakfast meat, eggs, smoothies, 21DSD paleo waffles (however I used half of the oil in that recipe), or even dinner leftovers. Who knew soup was good for breakfast?! And since I could have coffee, I used my homemade almond milk (as I have been) as my creamer. See the video of how to make almond milk here. Lunch: I really moved away from sandwiches and opted for leftovers. I also enjoyed tuna or salmon salad with homemade mayo, and a hot dog with probiotic sauerkraut. This is the recipe I used for the mayo. Snacks: nuts, kale chips, raw veggies, almond butter with green apples, smoothie or green juice, or rolled up meat like roast beef or turkey. Two other things I did was to make almond flour crackers (I was craving something crunchy) and a Paleo bread. I did use two teaspoons of honey in this recipe instead of two tablespoons. I decided it was my detox under my terms. It really helped me. At the end of the day, you need to be happy with your choices and how you feel. As I said, this was the first time I ended a “diet” and was motivated to keep going. I hope this review gives you some encouragement or ideas. If it does, please leave a comment. 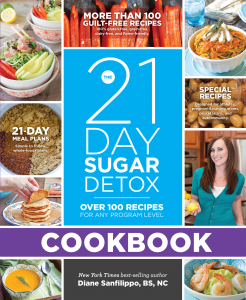 If you’re interested in checking out the 21-day sugar detox book, you can do so here. You can find a link to the companion cookbook here. These are affiliate links through amazon. I receive a small percentage of the sale and you never pay more. It helps to fund what I do so thanks!